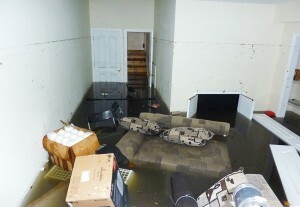 Flooded basements are a hazard in so many different ways. Sometimes it seems like you need a military barricade to keep the water out, or that the flooding is inevitable. If flooding is a hazard where you live, then it may be a good idea to learn how to properly clean up after an event. Knowing how to clean up a submerged basement can add years to the life of your home, and it may just save your life in the process. The first mistake people make when cleaning up after a flood, is that they go charging right into the water. This is the last thing anyone should want to do. Most houses keep the fuse box in the basement. That means you actually have to go into the basement in order to turn off the electricity. Everybody knows what happens when you have electrical outlets contacting water, you risk getting zapped, which could be fatal. If there are only a few inches of water, you may want to use a fiberglass ladder, some scrap wood or a plastic stool to traverse the lagoon to the electrical box. But if your basement is under significant water and the outlets are covered, then it is a serious electrocution hazard. At this point, it may be a good idea to call in professionals. You have a few different options at your disposal, and you definitely shouldn’t do it alone. You can call the Fire Department, but chances are they are busy. If your basement is flooded, than there’s a good chance the whole neighborhood is under water. You can also look up private professional on the Internet. They tend to be a bit quicker because you are paying for the service. Most people find it hard to grasp, but you should let go of your appliances. It may be a good idea to scuttle anything that got flooded. Don’t hold onto the appliances because they may have become electrocution risks all to themselves. When the water gets up into the internal workings, electrical parts become oxidized and wear down. This makes for open connections that can go off in humid conditions, potentially starting fires, and electrocuting those who touch the appliance. There are significant inherent dangers to a submerged basement. There are some steps you can take to prevent it from happening again, but if your basement got a catastrophic amount of water, you may want to bring in the pros.